Hello and happy Monday again! Ribbon, 2 x Buttons, Felt and a scalloped edge. I not only used the given recipe but I also stamped with this new House Mouse recipe stamp of Mudpie and Maxwell! How fun!! 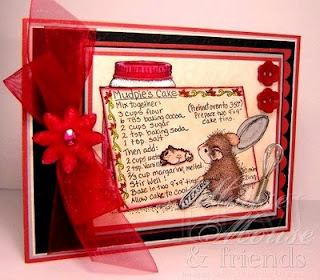 :) The name of this stamp is "Yummy Recipe" by Stampabilities, House Mouse Designs # HMKR1039. So so adroable. I love the one peeking through. Awesome coloring and ribbon bow! So sweet! What a fun little wire whisk! Great coloring! Gorgeous!!! Your coloring is fabulously flawless (as always), and the colors are fantastic...especially that vibrant red! I LOVE IT!!!! Lovely card, great twist with the recipe stamp too. I LOVE your take on this stamp and recipe. I can see why they posted your card on top!! Beautiful! Your blog is terrific, lots to be inspired by! Your recipe card is adorable. I love the whisk charm. Great effect. Very cute card. This is stunning, you have a great blog! Card is so adorable, America! i just love the image and the mini-whisk is very cute added touch! Gorgeous card! I love that little whisk charm (I went to check my stamp first, because I taught I had another version, lol).